* Daily direct flights from South Korean Peninsula / Japan / China with Korean Air, Asiana Air. 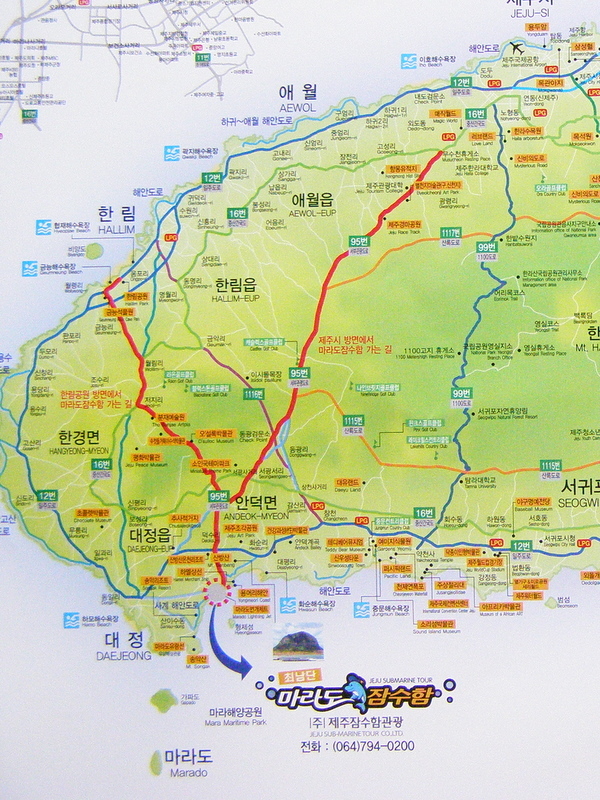 * Ferries from southern coastal cities of South Korea. 1. At Jeju Airport, to go the Tourist Information Desk to learn about the local bus system, lodging options and its reservations, and pick up some local maps. 2. If you don't speak Korean, I would advise to pick up a language guide book. 3. The summer is the peak tourist season. To avoid the crowds, I recommend visiting during late May and September into early October. The weather is still great for hanging out at the beaches. 4. If for some reason the bus you have been waiting for never arrives, then I suggest hitch-hiking. But use this method as a last option. Overall, Koreans are friendly to and intrigue by foreigners. Show the map to the driver where you need to go or to the nearest bus station. 5. For affordable accommodations, I recommend to stay at pensions, which is like a motel/inn usually with a small kitchenette or min-bauks, which is like a motel with a home-stay feel. Pensions are typically nicer than min-bauks. 6. 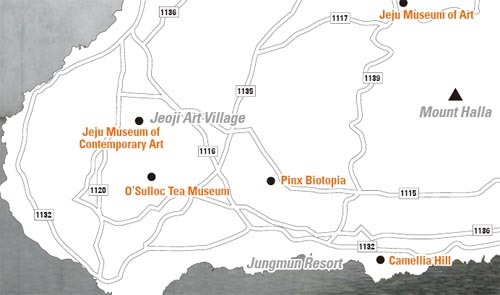 Jeju(do = island) makes an ideal getaway for a few days during your visit on the mainland of South Korea. Not to get overwhelm during your visit, I have decided to only highlight the western half of the island for you to leisurely enjoy your island experience. 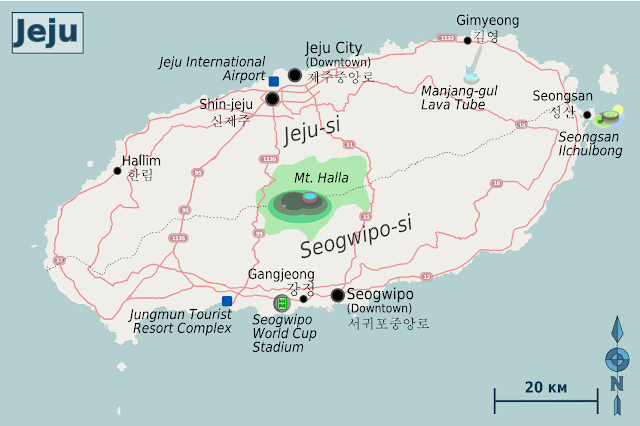 * To learn about public Shamen rituals and ceremonies held at various dates and locations throughout the island, read this article:http://jejulife.net/2008/11/11/jejus-shamans/ and then contact the writer: Brian Miller baraka49@yahoo.com to learn about the the upcoming events. Conveniently located a block away from 1132 highway, 5min walk from Intercity Bus Terminal, and 5 mins drive away from the airport. It offers multi-language service: English, Japanese, Chinese, Spanish, and Korean. 5 minute drive from the airport. A beautiful beach with turquoise blue water and white sandy beach located south of Hallim City center. Located right on Hyeopjae Beach with a great view from your room. When you get off the bus, you will notice this place right away. A beautiful view of the sunset behind the Sangbansan Mountain and it's not crowded. * This is the area to stay if you are looking for the 5-star luxury hotel experience. An unusual hexagonal rock formation created by an erosion of the ocean, wind, and waves. Quite an impressive site to see after a heavy rain. Although built recently in 1987 (entirely out of wood), it is still an impressive site to see. Climb to the 3rd floor to see 18,000 tiny Buddha figurines. Located north of the city out in the countryside. Yeon-dong, located south of the Airport off of northern 99/1139 Highway.